Product Image May Not Reflect Vacuum Type of This Model. Dotco Random Orbital Sanders feature hardened alloy steel cylinders and coated aluminum end plates that reduce overall weight and extend life. Dotco Random Orbital Sanders have a fan blade cooling system that helps lower bearing and spindle temperatures, resulting in high durability and longer life. Dotco Random Orbital Sanders feature a recessed lever that eliminates any pinch points and a vibration absorbing comfort grip and ergonomic wrist support that improves feel and increases maneuverability. Dotco Random Orbital Sanders come with standard with 3'' and 2 3/4'' grips. Dotco Random Orbital Sanders have 360° rotating exhaust vanes that help to direct air away from operator. Whether you are working with wood, composites, solid surfaces, fiberglass, metal or stone, Dotco Random Orbital Sanders can provide a cost effective finish to your exacting needs. The DSRO-01-05HL Dotco Random Orbital Sander, Non-Vacuum is one of thousands of quality tooling products available from MRO Tools. Please browse Dotco Random Orbital Sanders for tools similar to the DSRO-01-05HL Dotco Random Orbital Sander, Non-Vacuum. 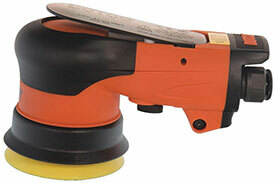 DSRO-01-05HL Dotco Random Orbital Sander, Non-Vacuum description summary: Dotco Random Orbital Sander. Vacuum: Non-Vacuum Free Speed OPM: 12000 Pad Size: 5''/127mm Pad Face: Hook & Loop Vacuum Type: Non-Vacuum Air Flow @ 90psi: 12SCFM/340LPM Quantity discounts may be available for the DSRO-01-05HL Dotco Random Orbital Sander, Non-Vacuum. Please contact MRO Tools for details.